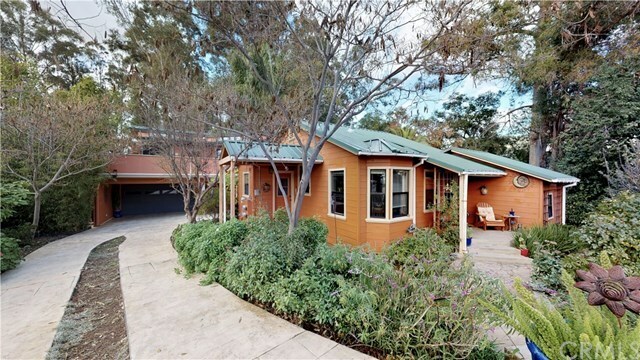 A rare opportunity to find such a unique property in SLO! Two homes with year round creek and a short distance to downtown. The front home is a remodeled 2 bedroom, Â¾ bath home with original hardwood floors. The kitchen is adorned with beautiful accent tiles, hammered copper farm-style sink, stainless steel appliances, and a sunny kitchen nook. Separate indoor laundry and private side yard. The main/back two bedroom home, is entered via the second story patio with a built in gas BBQ. It is an ideal space for entertaining and also features an outdoor shower. The open floorplan features a large butcher block island, stained concrete floors that include radiant heat and a wood burning stove. The master has a suspended Queen bed while the Master bath includes an oversized shower. The well thought out window placement allows ample light through out. The ground floor of the house has a double garage and smaller third garage bay, laundry area, office and a full bath. Flooring is a combination of stained and polished concrete. All around the outside is custom stamped concrete and beautiful yards with multiple fruit trees. The attention to detail is not to be missed on any part of these lovingly well cared for homes. The property was a recipient of a 2004 San Luis Obispo Beautification award and has been featured in SLO Life magazine. Come see for yourself the opportunities has for you! !